Fibonacci Retracements are used to estimate likely reversal points during an up- or down-trend. Percentage retracement levels, based on significant Fibonacci numbers, are plotted as horizontal lines against the latest trend move. Click the select button to complete the drawing. 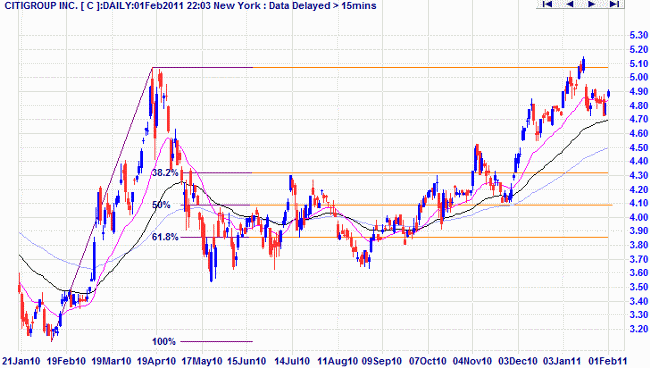 Note how the retracement found support at the 38.2% and 61.8% levels. Add or delete Fibonacci levels by right-clicking on any Fibonacci Line and selecting Fibonacci Drawing Options (or select Draw >> Draw Options >> Fibonacci from the chart menu). 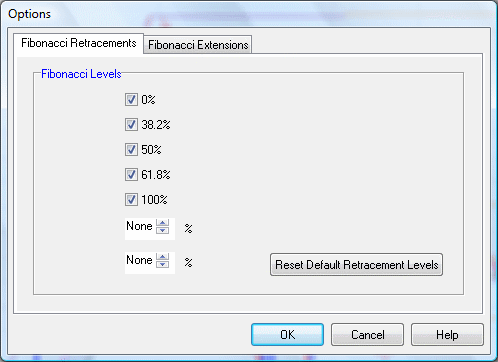 You can add further levels, remove existing levels or reset the default fibonacci levels. Amend Fibonacci colors by right-clicking on any Fibonacci Line and selecting Adjust Line Color. 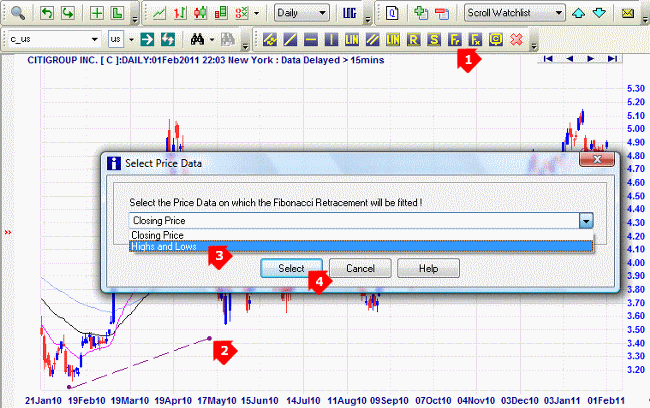 To change the default color for all Fibonacci lines, select Format Charts >> Colors >> Fibonacci Retracements (or Extensions) from the chart menu. To delete Fibonacci Lines, right-click on one of the lines and select Delete from the menu.